Lactic acid bacteria, yeast and phototrophic bacteria contained in EM-1 have the ability to ferment organic substances. Compost fermented and decomposed by EM is broken down in the soil and absorbed by plants. Also, EM contains many useful components to promote plant growth. In aqueous environments, EM decomposes sludge by fermentation and makes it easy for other microorganisms and protozoans to eat the breakdown products. 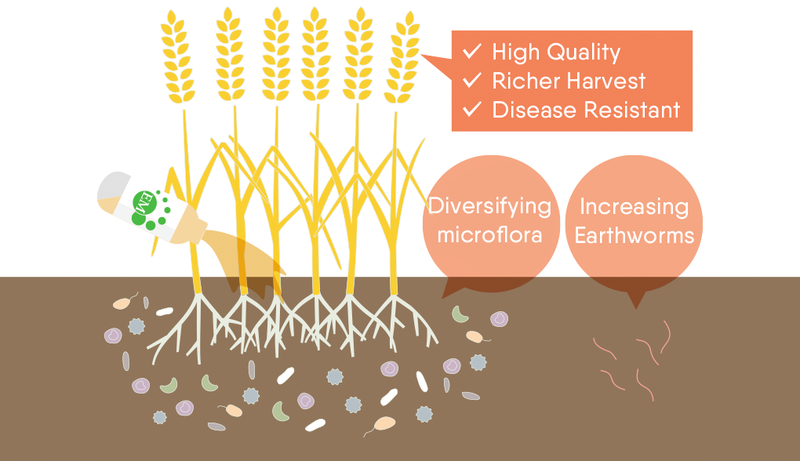 Moreover, in addition to microorganisms, EM contains metabolites produced by various microorganisms and these will activate the microorganisms which already exist in the soil and help to diversify the microbiome. Microorganisms form the base of the ecological pyramid, so when microorganisms in soil are diverse, the ecosystem in the soil will be enriched in various ways, such as an increase in the number of earthworms. A healthy and diverse ecosystem will help to form rich soil. How do EM products work in the soil? Large numbers of bacteria exist in the soil. One gram of soil contains anywhere from a few hundred million to several billion microorganisms. Microorganisms are a fundamental component of the ecosystem and facilitate its functioning by breaking down organic substances and circulating nutrients. However, when the quantity of healthy microorganisms in the soil decreases or the balance is disrupted, other living things such as earthworms will be negatively affected and the soil will become impoverished. 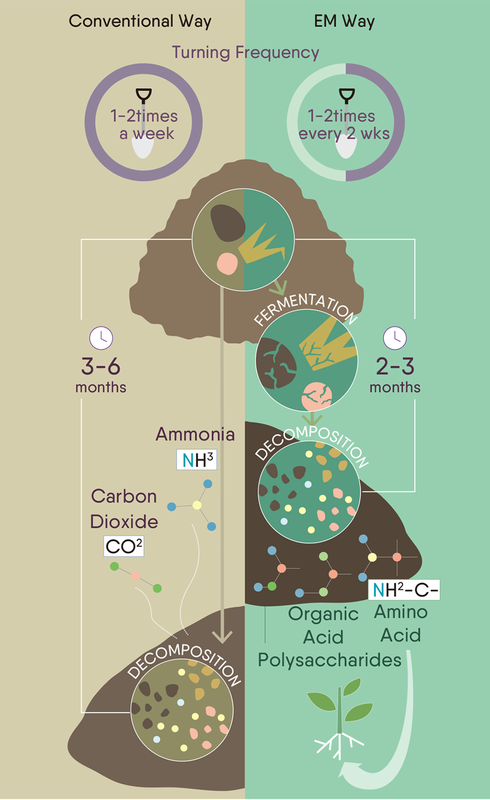 The diversity of microorganisms contained in EM and the metabolites they produce will increase the number and diversity of microorganisms in the soil. When microorganisms are activated, protozoans and larger organisms such as worms will increase in number and a healthier ecosystem will result. Soil with diversified microflora will inhibit the growth of specific disease-causing bacteria, which help prevent cultivation failure. Lactic acid bacteria, yeast, and phototrophic bacteria contained in EM have the ability to ferment organic substances and prevent putrefaction. Therefore, for example, when making compost with EM, putrefying bacteria will be suppressed and, due to the fermentation action of EM, it is possible to manufacture compost with less turning than usual. Also, compost fermented by EM is rich in amino acids and polysaccharides compared with compost produced by the usual methods. EM prevents the production of ammonia during protein decomposition, metabolizing proteins in such a way that amino acids are produced instead. These amino acids can be directly absorbed by plants. Also, under normal circumstances, cellulose will be decomposed and broken down to form carbon dioxide. However, due to the fermentation action of EM, low-molecular polysaccharides will be produced and these will be absorbed by microorganisms and plants. Generally, proteins are synthesized from nitrogen. However, if the plants can directly absorb amino acids from their roots, they can repurpose the energy that would have gone into producing amino acids and proteins, thereby producing fruit with more sugar. Fertile soil and biodiversity is important for organic farming. However, normally, sophisticated technology and a long period of time is needed to establish a productive organic farm. By actively using beneficial microorganisms, EM products speeds up this process, makes organic farming easier, and also helps to improve the yield and quality of produce. EM products that promotes biodiversity have also been applied in the fields of animal husbandry, aquaculture and water purification. In animal husbandry, EM will improve the microbial environment of barns as well as the intestinal flora of livestock and will ameliorate noxious odors. In aquaculture and water purification, EM will make the ecosystems in water richer. This will improve the self-purification capacity of water bodies and improve water quality.